Its quite normal for your Windows 10 PC to slow down after several app installs. Lagging could also be as a result of driver, registry or malware issues. Although we’d dropped a very helpful guide on how to fix a slow PC, resetting is sometimes the easiest fix but the fear of losing important files deters many. This guide will teach you how to reset your Windows 10 PC and most importantly, not lose your valuable files. Will I lose my files and installed applications after I reset? Installed applications? Yes. Files? depending on your selection. As a rule of thumb, backup all your important files to an external storage device (SSD, HDD, SD card or Flash drive). 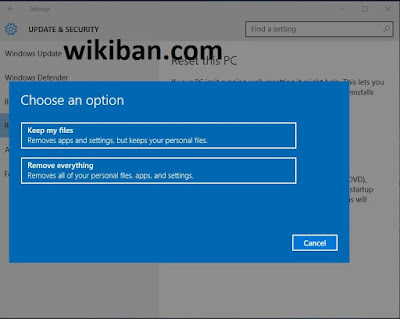 This guide is however aimed at preventing file loss as a result of the Operating System (OS) reset. How do I reset my Windows 10 PC and still not lose my files? * Note: Ensure that the PC’s battery is well charged or charging throughout the process (recommended) to avoid an interruption due to a drained battery. If you wish to retain your files but remove apps and settings, select Keep my files (Recommended). If you wish to remove apps, settings and files, select Remove Everything.